Watch Hilarious Video Of Chris Hemsworth Getting Scared By A Wittle Mouse (VIDEO) - T.V.S.T. Avengers: Endgame is set to be released later this month, and it’s definitely going to break nearly every box office record out there. Chris Hemsworth will play a big role in the film as Thor. 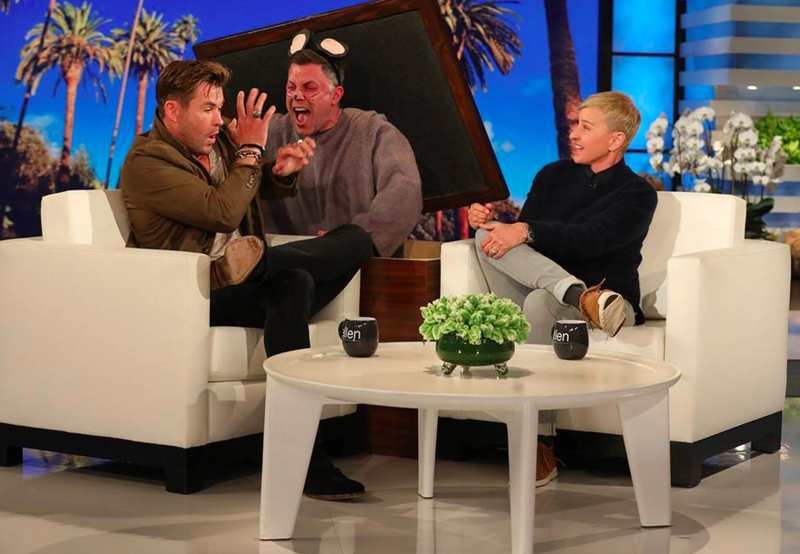 And while promoting the movie on The Ellen DeGeneres Show, the big man got scared of a little mouse. Okay, maybe it was a man popping out of a box DRESSED as a mouse, but it’s funnier to just say it was a mouse. Ellen set up this scare perfectly. She was talking to Chris about all his animals in Australia, and then asked him what animals scare him. He was having trouble thinking of anything that scared him, ’cause after all, he’s f**king Thor! But as he was trying to search for an answer, the man dressed as a mouse jumped out of the box and scared the f**k out of him. He was legit scared. “You almost punched him!” Ellen said, to which Chris replied, “I did not at all punch it. I went straight to ‘retreat! retreat'” I love that he was still referring to the dude as an “it” as if he wasn’t sure if it was a half man/half mouse. The good news for Chris is that there’s no shame in his game. Dozens of celebrities have been scared by that damn box. At some point, we need to go through the videos and create a “best of” because there are some legendary reactions. Gabrielle Union Steps Up And Supports Dwyane Wade's 11-Year-Old Son Zion At Pride Parade In Miami!